When it comes to women's college basketball, anytime you're mentioned with UConn head coach Geno Auriemma you're doing something right. 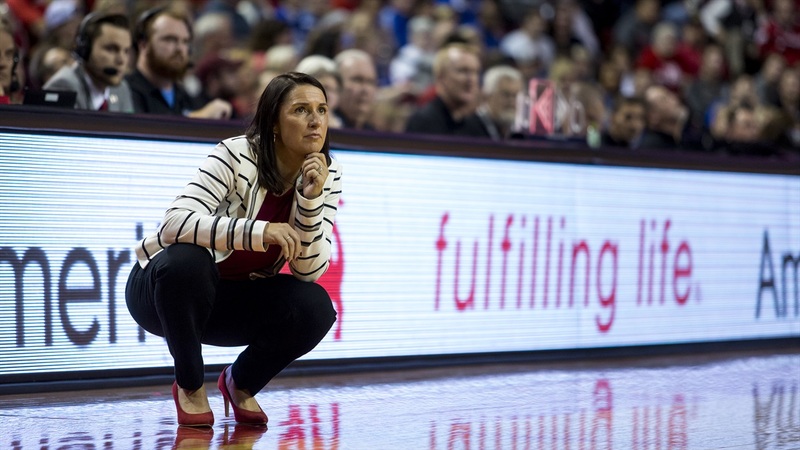 Amy Williams, the Huskers' second-year head coach and architect of a major basketball renaissance in Lincoln, is doing a lot of things right. Wednesday morning she was announced as one of ten finalists for the Werner Ladder Naismith Women's Basketball College Coach of the Year Award. Nebraska currently sits at 19-8 on the season, 10-4 in conference play and a near-perfect 9-1 on the road. The Huskers still have an outside shot at a regular season conference title with two games left to play. Compare that to a season ago when Nebraska finished off the regular season dead last in the Big Ten at 7-22 (3-13 in-conference) and the results speak for themselves. The only Big Ten coach to be named a finalist, Williams joins Auriemma, Vic Schaefer (Mississippi State), Jeff Walz (Louisville), Kelly Graves (Oregon), Kim Mulkey (Baylor), Muffet McGraw (Notre Dame), Robin Pingeton (Missouri), Karen Aston (Texas) and Joni Taylor (Georgia). That group will be whittled down to four names on March 16 with the winner being named on March 31. There is a fan vote component to the process, with fans having the chance to vote here from March 19 through March 30. It will count for five percent of the overall final vote. Williams and Nebraska host Penn State (15-12, 6-8 Big Ten) on Thursday night at Pinnacle Bank Arena for Senior Night at 7 p.m.